Creggan Country Park landscape design proposals were prepared to convert an existing reservoir and open field to a new and exciting country park for outdoor recreation. The site, lying on the outskirts of Glenowen, included a dammed freshwater reservoir with steep sides surrounded by grazed farmland. 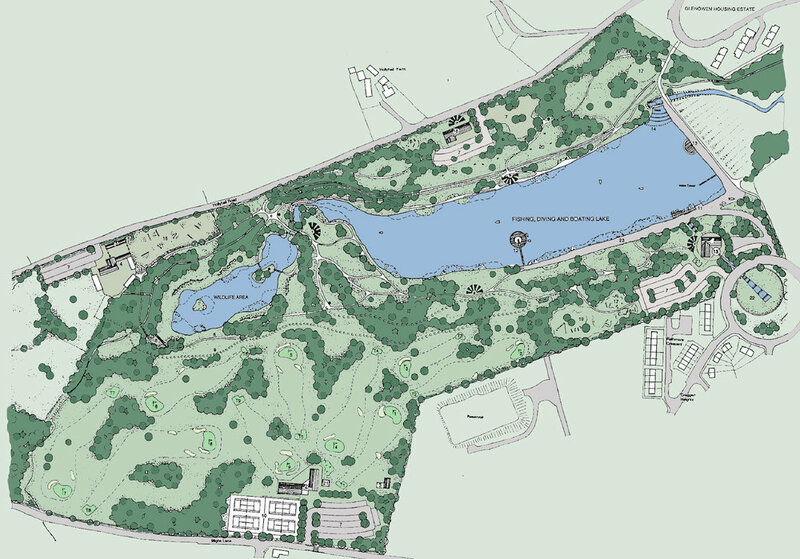 The proposal sought to provide the local community with a variety of facilities including a new equestrian centre, angling club, a 9 hole golf course and tennis courts. The golf course was laid out to take advantage of the natural topography and views to the wider landscape and included a small club house. A second lake was to be re-modelled to provide a habitat for wildlife with viewing platforms and hide for bird-watching. A ‘community farm’ was proposed to act as a catalyst to encourage the local community to take ownership of and become actively involved in the long term development and management of the park. The farm was also intended to provide a local school with a valuable educational resource on their doorstep.